Import your proposal data from BOEMax to quickly establish the budget baseline. Keep track of changes with built-in change control and historical traceability. Generate a range of optimistic and pessimistic estimates at completion. Create compliant and ad-hoc reports with easy-to-use wizards. "EVMax surpasses Cobra and a lot of the other earned value engines in the market today. EVMax is a little more user-friendly...and the seamless integration between EVMax and BOEMax—other tools don’t have that type of capability." "I just wanted to thank ProjStream VERY, VERY much for the efforts you have put into the Program Change Log in EVMax, IT ROCKS!" "...paid for itself after the first proposal"
"It has definitely given us a competitive advantage in a tough marketplace and has essentially paid for itself after the first proposal." Pull your basis of estimate and cost estimate data from BOEMax into EVMax to establish the budget baseline. As your budget changes, make updates in BOEMax and push them to EVMax using the built-in workflow process, automatically producing the baseline change documentation. This also makes rolling wave planning a breeze. 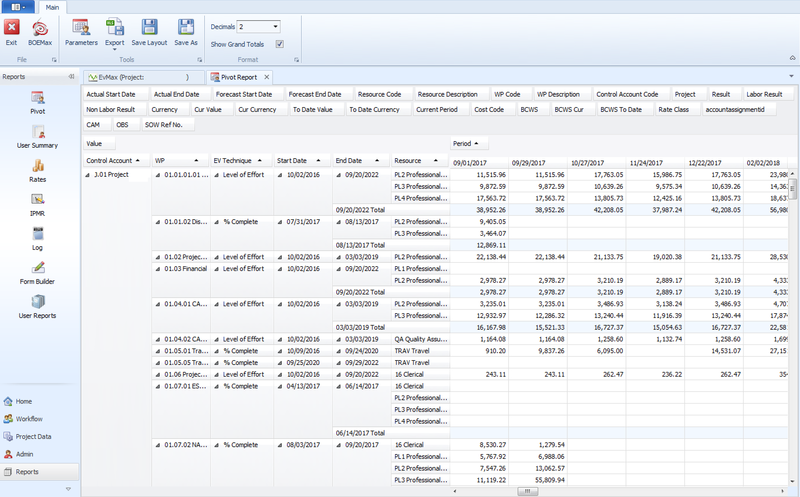 See all your time phased cost data at a glance with an Excel-like pivot table with a true hierarchical structure and data roll up. Your CAMs and project controls team can easily enter budget hours, full-time equivalents (FTEs) or cost in a central database. Create customized or role-specific data views with filters, sorts, and other user controls. Include the basis of estimate rationale, risk assessment, assumptions, and other details with the cost data. Project teams can use the basis of estimate details to substantiate the time phased budget plan or estimate to complete as well as to produce baseline change requests. It can also be used to document quantifiable backup data for claiming earned value. Easily import your work breakdown structure (WBS) data, resources, task information, rates, bill of material, actual hours, costs. If you can imagine it, we have a way to map data into EVMax from Excel. Use the resource loaded activities to quickly create schedule driven budget baseline or estimate to complete data in EVMax. You can also use the current schedule status as the basis for claiming work package earned value. Ensures your schedule and time phased cost data are always in alignment. Create simple or complex burden rules with custom expressions, constants, and math operations to model your business environment. 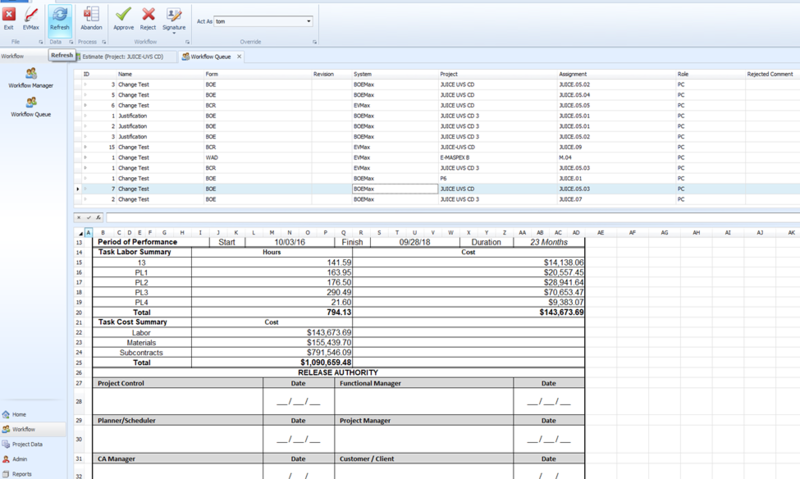 Build cost rules into your labor categories or resources such as bill of material quantities. This simplifies data entry and improves budgeting consistency. Use the built-in reporting wizard to quickly create ad-hoc pivot tables. You can easily produce standard reports such as a Responsibility Assignment Matrix (RAM) with dollar values or Control Account Plans. You can also produce a variety of electronic deliverables. This includes the current Integrated Program Management Report (IPMR) Data Item Description (DID) UN/CEFACT XML deliverables for the DoD EVM Central Repository as well as the JSON encoded deliverables for the IPMR Revision B. Establish workflow roles, routing rules, and common forms including baseline change requests (BCRs) and work authorization documents. Automatically maintain a historical archive of basis of estimate, work authorization, and BCRs moving through the workflow review and approval process with data-backed documentation. Have an issue? Send us a ticket and we’ll resolve it quickly—regardless of the problem’s complexity.